One of the responsibilities that comes with owning a bathtub is making sure it stays clean. It may not be a fun responsibility, but maintaining your tub's appearance (whether it's porcelain enameled steel or fiberglass) will avoid having to replace it altogether. Your tub’s appearance can be easily tainted by soap scum and residue from bath salts, oils, and other products that you may use on a regular basis. The good news? There are a ton of cleaners to help keep your bathtub in tip-top shape, and each formula is designed to tackle different issues. Some are natural, some are designed for hard water stains, and some can even be used to clean your whole house. To help you select the best product for your needs, here are some of the most popular bathtub cleaners on the market. 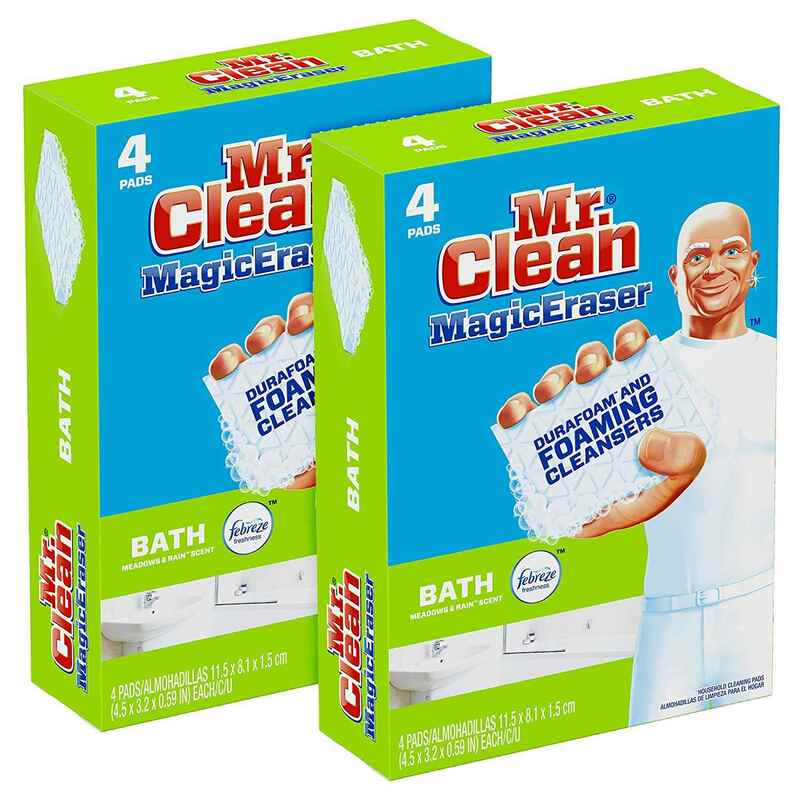 People can’t say enough good things about these Mr. Clean Magic Erasers for ease of use and effectiveness. Designed specifically for baths, they’re larger than typical Magic Erasers, so you can clean large areas more quickly, and they’re infused with Durafoam to help remove soap scum and other grime left behind in your tub. To activate, you just add water. No need for buckets, sprays or extra sponges—all you need is this scrubber to get your tub (and the rest of your bathroom, for that matter) in tip-top shape. Customers rave about the results and love how easy they make cleaning. “Seriously where have you been all my life?” one reviewer wrote online. Hard water can be hard on tubs, leaving behind build-up and stains, so you need a tough cleaner like Bioclean to take care of it. It’s formulated specifically for hard water problems, including rust, mildew, and mold, and promises to even take out stains that have been there for long periods of time. As tough as it is on grime, however, it’s biodegradable and easy on the environment. You can use it beyond your bath too, everywhere from you car to your pool and kitchen countertops. If it doesn’t leave your surfaces looking like new, there’s a 100 percent money-back guarantee for the first 60 days after you purchase it. Customers are wowed by this cleaner, with hundreds leaving positive reviews saying it works like no other. They love that it’s nontoxic and say it leaves a clean, fresh smell rather than a heavy chemical one like some cleaners. Soft water may be a bit easier on tubs, but you still want a cleaner that can stand up to stains and grime. This one from The Bucko is up to the job. While it’s non-toxic and free from harsh chemicals, it’s tough enough to take out rings around your tub and other stains. You likely won’t even need to do any scrubbing as most jobs just require that you spray it on, let it sit a few minutes, then wipe the gunk away. You can use it beyond your bathroom to clean your kitchen, cars, outdoor furniture and more, so it’s a great all-around cleaner. Just don’t use it on wood, painted surfaces, natural marble, stone, brass, or colored grout. Customers rave about this product, and the before-and-after pictures of various showers and tubs posted by those who have used it are impressive. They say it leaves their tubs and showers looking brand new, and they can’t believe how little time and effort it takes to see stellar results. When it comes to mold, you want a cleaner that doesn’t mess around like this RMR-86 Instant Mold Stain & Mildew Stain Remover. It claims to remove stains in 15 seconds flat with no need for scrubbing, and hundreds of customers say it lives up to that promise. The bleach-based formula works on most surfaces, including fiberglass, tile, grout, and wood, but it shouldn’t be used on metal. Customers are wowed by the results and can’t believe how quickly it works. Some caution that the smell is strong and can be overpowering if you don’t ventilate the area in which you’re working. Most, however, say this cleaner can’t be beat when it comes to melting mold away. Nobody wants to step foot in a tub that's coated in soap scum. If you want a cleaner to help you blast through it fast, we recommend this one from Method. Not only does it take out tough dirt and scum, but its eucalyptus-mint scent leaves your bathroom smelling fresh and clean. The natural formula is derived from plants so it’s easy on the environment, but it doesn’t sacrifice any tough cleaning power. Spray cleaners are easy to use, which is why they're in heavy rotation in most cleaning cabinets. Just spray this cleaner on the surface of your tub and wipe away soap scum, dirt, rust hard water deposits, and almost anything else that's accumulated on your tub. You can even use it in your kitchen, too! The biodegradable formula doesn’t contain any bleach or ammonia, and it meets the Environmental Protection Agency’s Safer Product standards. Customers say this cleaner is surprisingly effective, particularly on hard water stains. While some aren’t fans of the scent, others remark that it’s nice and fresh. When you want a cleaner that’s really going to cling to surfaces, a foaming spray like this one from Scrubbing Bubbles is a solid choice. Formulated to take on mold, mildew, and soap scum, it's safe to use on surfaces other than your tub. Those little bubbles can get in all the nooks and crannies, leaving every surface clean and shiny. It’s available in two scents—rain shower and citrus—that both leave your bathroom smelling bright and fresh. To use, simply spray it on, wait for the bubbles to do their work, then wipe or rinse clean. Scrubbing Bubbles has been a trusted bathroom cleaner for years, and customers say it’s everything they want in a cleaner and more. While some cleaners may pack a powerful punch to eliminate soap scum and grime, they’re also packed with chemicals you don’t want around your family. This cleaner from Puracy, however, is all natural and nontoxic, but it still cleans like a dream. In fact, it was developed by a team of doctors. While it’s especially effective at keeping your tub in tip-top shape, it’s a great overall cleaner that can be used on most surfaces, from your hardwood floors to your kitchen countertops and beyond. It has received numerous awards, including being named “The Best All-Purpose Cleaner” by The New York Times, and customers sing its praises as well. They say it’s gentle and effective, and they find themselves reaching for it over and over again. Our writers spent 5 hours researching the most popular bathtub cleaner on the market. Before making their final recommendations, they considered 20 different cleaners overall, screened options from 20 different brands and manufacturers, read over 100 user reviews (both positive and negative), and tested 3 of the cleaners themselves. All of this research adds up to recommendations you can trust.